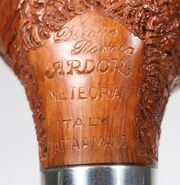 Ardor Courtesy of italianpipemakers.com In 1974 Dorelio Rovera, with his father Angelo, established the Ardor Pipe, name which comes from the "AR" (Angelo Rovera) and "DOR" (Dorelio Rovera), changing a medium quality level production into a completely handcrafted product, with a very high level of design and finishing. 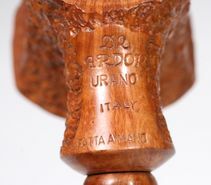 Editor's Note: Angelo Rovera is the son of Francesco Rovera, who along with his brothers comprised Sociedade Rovera, a pipe company they founded in 1911. Dorelio personally chooses the briar which is left seasoning for at least 4 to 5 years before it is worked. It is stocked in particular baskets which leave the wood always visible and airy. 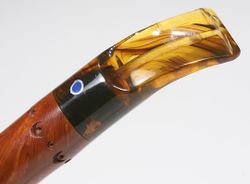 The pieces chosen to become a pipe are cut with a circular saw to identify the model. Then each piece is rough hewn by hand with special files, definitely "dangerous" but very efficacious to give the shape to the wood. Like most artisans, Ardor couples a classical style and a very original style with definite but free and fanciful lines, to offer and meet the largest number of requests, from the simple to the most complex. Ardor is a pipe company which is always looking for innovations, indispensable to collectors, but trying to offer a very high level product in the smoking aspect and performance of the briar, always dried and light for a higher comfort of the smoker. With Damiano, Dorelio's son, Ardor introduced the coloured methacrylate (acrylic) stems, really appreciated in the international markets. Damiano has been able to condition the Ardor style with new shapes and with a new mouthpieces style, having a modern point of view. His target is to keep up the interest of new generations, surely more variable in a shorter period. This article originally appeared in The Pipe Collector, the newsletter of the National Society of Pipe Colectors (NASP), and is used her by permission. It's a great organization--consider joining. If you have a few minutes, I'd like to share a story with you. In fact, get your favorite pipe, load it with your best tobacco, make yourself comfortable, and light up while I collect my thoughts. I have smoked pipes for well over 40 years, including pipes made by Weber, Comoy, Peterson, Ben Wade, Lorenzo, Willmer, GBD, Savinelli, Charatan and Sasieni. But it was in the 1960s when I smoked my first Caminetto that I did a double back flip. My collection definitely turned in that direction. When Davoli died, Ascorti and Radice left Caminetto and began their own brands. 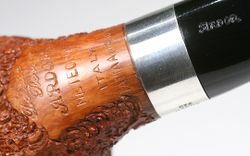 I added Ascorti, Radice, Armellini, Amorelli, Ser Jacopo, Dunhill and a few others to my collection. During the 1980s, I started looking for bigger pipes. Since my first love was Italian briar pipes, I filled this desire by purchasing my first Castello Great Line from Chuck Rio. 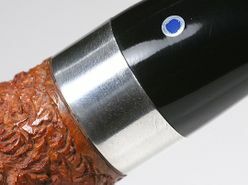 I all but camped on the doorstep of Scott Eskra of R & E Pipes trying to be first to grab the largest Castellos. I soon learned, however, that the demand exceeded the supply. This was especially true with the Sea Rock and Old Antiquari Great Lines. One day, when I was pining over the current R & E inventory, Scott showed me a good-sized Ardor. I bought and smoked it right away. It was a Grreeaat Pipe, so I called Scott and said, "Another one please, but bigger." Before long, I had a standing order for Scott to call me whenever he received his Ardor shipment and to save me the largest ones. Nevertheless, I kept asking and asking for bigger and bigger pipes. At the Columbus, Ohio show, Scott introduced me to Steve Monjure. I was impressed that Ardor purchased briar from each area, timed to insure the best selection and highest quality of briar. 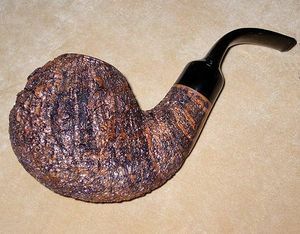 I learned that Ardor hand-selected aged Mediterranean briar and then air cured the briar for another ten years. I appreciated the fact that no filler was ever used. Additionally, they were entirely hand made with hand-cut acrylic bits, just as I preferred. 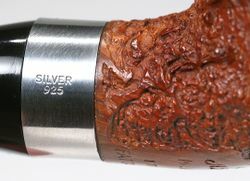 Best of all, the prices were more affordable than many of the other pipes I had been collecting. As R & E began to handle fewer Ardors, I turned to Steve for the bigger pipes. He was easy to deal with and a true gentleman. I can sum it up by saying that I think Steve is the Henry Ford of Pipes because Ardors are a great pipe priced for the everyday man. They are true work horses, by which I mean that you can smoke them again and again, day after day, and they remain cool, dry smokes. Steve truly seems to enjoy his work and is into pipes for the long haul. He is very open to feedback and listens to his customers and what they are looking for in a pipe. You get the feeling that you are not just another sale and that he wants to keep you as a customer. For all these reasons, I bought every large Ardor I could lay my hands on. As always, I requested bigger pipes. Eventually, Steve started having these huge pipes stamped "Giants." I was now well on my way to collecting the big uns. In my eyes, the Giants were even more of a bargain. Where else could you buy such large pipes for Ardor prices? Eureka, Stella got her groove back! In 2002, I drew several pipe shapes that I wanted made. Steve liked some of the shapes, and thus the J. Morrison series was born. By this time, the Giant Ardors seemed to have earned a large following, creating more demand and a great deal of competition for me. And no wonder. 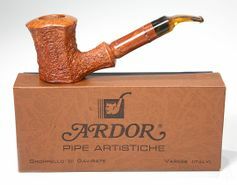 Unlike the one black Model T, you could buy Ardor pipes in carved, sandblast, meteora and smooth (multiple grades) finishes and in Natural, Tan, Brown, Black and Red/Brown colors. I liked the idea that while I could choose from several hundred shapes, each pipe was hand crafted and unique enough to satisfy my own individual bent. For any one shape, there are more variables than just color and finish. This keeps the pipes fresh and interesting and not just another spoke in the wheel concept. For those days when I feel particularly bold, dashing, and dapper, I can smoke a pipe from the fantasy series. These pipes depart even more from the shape chart and use silver and different colors of acrylic as accents. 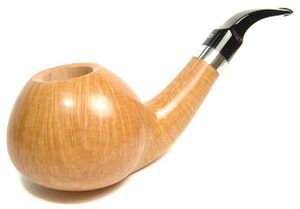 What more could you ask for than a great pipe to smoke on all occasions? Of all the shapes, the over-sized, long-shanked Canadians have always been one of my favorites. I drooled over the Ashton Magnum Canadians for some time but balked at the $1,800 to $2,000-plus price. After all, my first car cost less than that. 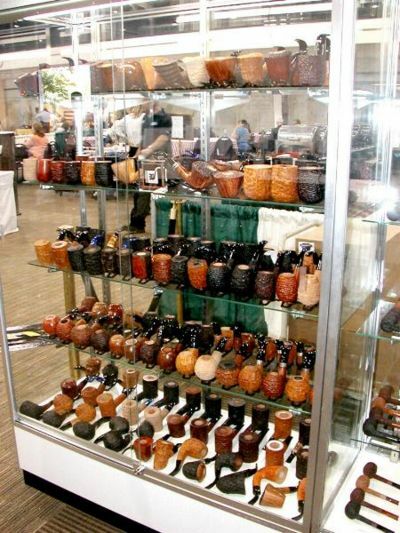 I showed that pipe to Steve at one of the pipe shows and put my order in for one, just bigger. Now, I simply can not get enough pipes in that shape. I have a standing order for 20 just in case. Each show, I watch Steve sell pipe after pipe. I enjoy talking to some of his customers. And walking around the show floor, I often get engaged in a conversation when someone makes a comment about whatever Giant Pipe I am smoking. I have yet to encounter one person who has a bad-smoking Ardor, which brings up a good point. 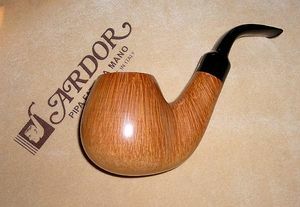 Another thing I like about Ardors is that they smoke consistently good…they are all great smokers! I have paid more money for pipes that were not as consistent and others that you could not smoke twice in a row without affecting the taste. I have had good pipes, some not so good, and some of both categories within the same brand (all too often, unfortunately). 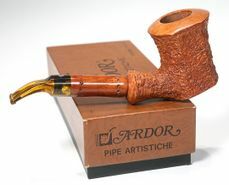 I truly feel you are getting value for your money and a great pipe when you buy an Ardor. Obviously, that is why Steve sells so many Ardors. They smoke better than a lot of pipes that cost a whole lot more. People seem to be puzzled as to why I like such big pipes. There are reasons beyond the fact that they smoke cool and dry. Some reasons go beyond the smoke. I really like the wood, the grain, as well as the feel of a large pipe in my hand. For me, the best part of a smoke, besides the first few puffs, is the last fourth of the bowl. All the moisture in the tobacco is gone and the flavor or taste turns to a nice toasty, smooth and mild treat. If I am truly in the zone and doing everything right, there will only be a few dry flakes when I finish the bowl. Since that is the part I enjoy the most, I want to make that portion last longer. If you're thinking, why don't you just smoke two or three pipes instead, you have missed the point. For example, if you really love your coffee in the morning, do you drink six or seven really small cups or do you drink two or three large cups? In my case, I think you already know the answer. So I kept to my game plan of buying Giant Ardors and requesting larger ones. Then, ironically, fate intervened again. Dorelio found, hidden away, some old, extraordinarily huge blocks of briar. While the Rovera's were gleefully trying to decide what to do with them, I was busy putting a bee in Steve ear to, at the very least, make a few of the blocks into oversized Giants, per chance Canadians. Steve's final decision on the matter was to introduce a new line of Super Giants. As you would guess, these super big boys are as rare as hen's teeth. 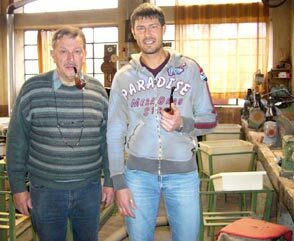 I think Dorelio and Damiano (the fourth-generation pipe carver) Rovera should be very proud of their artistry and craftsmanship and what they have been able to accomplish with their pipes. Of course ,Steve is very much at the heart of this endeavor and deserves a lot of the credit for the tireless work he puts in. No wonder Steve puts so much energy into his work; he is in the business of selling a product that gives contentment, satisfaction and relaxation. To repeat myself, Ardors are consistently great smokers…but…every once in a while…you come across something that transcends greatness, that goes beyond what you thought was possible. I don't know if the universe hiccupped, if the stars and planets were aligned just right, or whatever, but I… have…that…pipe! 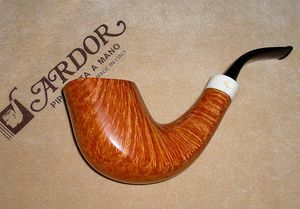 It is my Ardor Tan carved Super Giant Canadian with an apricot oval mouthpiece (a picture is on Steve's website). It is "beam me up Scotty" good, a "porter house steak cooked to perfection after a hunger strike" good. 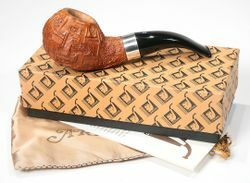 This pipe is so exceptional that the first time I smoked Lanes Crown Achievement in it, I did not recognize the tobacco. It was a smooth, spicy taste with so much smoky flavor from the Latakia that I started looking around for the Barbecue Pit, and I noticed that the Crown Achievement had lost the edginess that some people talk about. With a favorable wind, I can get a five-hour smoke that ends with a smile on my face like a wave on a slop bucket and nothing left in the bowl but dry, whitish-grey ash. This is some serious pipe with an attitude. Well, it has been fun. Thanks for having a few puffs with me. I just wanted to share with you, my friends in the pipe community, some of the reasons I enjoy the large Ardors and why my collection turned in that direction. I started out just wanting a few large pipes, and, before I could say Giant Ardors three times really fast, it turned into a collection. Regardless, along the way a wonderful thing happened. I met a lot of nice people and made some real friends. I look forward to seeing you at one of the shows. As Paul Harvey would say, "Now you know the rest of the story." 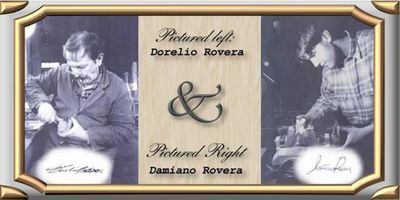 Ardor Pipe Di Dorelio Rovera & C.
This page was last edited on 24 February 2019, at 12:38.